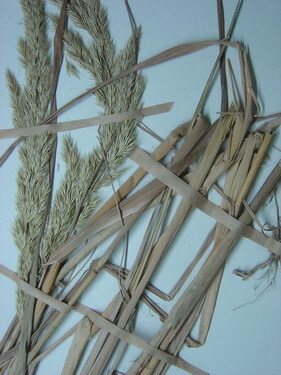 Calamagrostis Adans., Fam. Pl. 2: 31, 530. 1763. Perennials; culms stout. Blades linear, the apex acuminate; ligule membranous, usually cylindrical. Inflorescence a contrated or loosely open panicle, the branches erect, slender, sometimes scabrous. Spikelets linear, 1-flowered; rachilla arthiculating above the glumes, usually not protruding; glume of nearly equal length or the lower slightly longer, subulate-lanceolate, narrowly acuminate, 1-nerved or the upper glume 3-nerved; lemma translucently membranous, shorter than the glumes, minutely tooted or 2-cleft, with an awn arising from above the middle of the back or from the sinus; callus densely silky, the hairs longer than the lemma; palea small, shorter than the lemma. About 80 species in the temperate regions. Only one species C. epigeios is found in Taiwan.